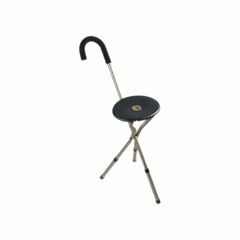 The Elite Cane Seat goes from walking stick to restful seat in an instant. Polished aluminum frame with green seat. The Elite Cane Seat weighs less than 2 lbs. 18(1/2)" seat to ground. Easy To Use. Safe. Supports Weight. Well Constructed. Stores Easily. Lightweight. My wife and i both love our canes. We both have trouble walking any long distances and to be able to sit when we need is great. Safe. Easy To Use. Lightweight. Supports Weight. Well Constructed. Long Distances. Outdoors. Short Distances. Due to nerve damage to ankles I needed something that I can stop and rest when needed. I live by the French Quarter and enjoy visiting. The chair comes in handy, its light but well made. Lightweight. Supports Weight. Stores Easily. Safe. Well Constructed. Easy To Use. Indoors. Outdoors. Short Distances. Wet Weather. Long Term User. Elderly. Caregiver. Excellent product, exactly as described. Don't be afraid to try it! Lightweight. Stores Easily. Supports Weight. Easy To Use. Variety of color may be helpful. Or personalize it some how. What is the length of the cane chair when it is folded to carry? Thanks! Does the height of the cane adjust? I am 5'2" and need it to be quite short. How much weight will this cane hold comfortably? can you tell me the size of the seat? I am a bigger woman - I weight 240lbs. Do you think it would be a comfortable seat for a bigger person such as myself? Must you straddle this cane seat? Women, what do you think? what is length of cane?? Is it available at 36"
When folded, does it fit in a carry on suitcase easily? I've been using this cane for a number of years and through several flights, both domestic and to Europe. It doesn't fold vertically, so won't fit inside a carry-on, but easily stows on the floor or along the window wall in a plane. What is the weight capacity on this cane seat? I'm looking for one with a weight capacity from 275-300 lbs. Thanks for any help you might be able to provide. The Elite Cane Seat has a weight capacity of 250 lbs. We currently do not have any Cane Seat with a weight capacity of 275-300 lbs. We do have rollators that would serve the same purpose. Try out "Invacare Four Wheel Rollator".